If you’re looking for a backpack that’s fashionable enough for work, but can also be used for short trips, the Knomo LiveFree Backpack is for you. Not only is it an attractive everyday bag, but it’s chock full of tech that makes it easy to carry and get more out of the tech you need. 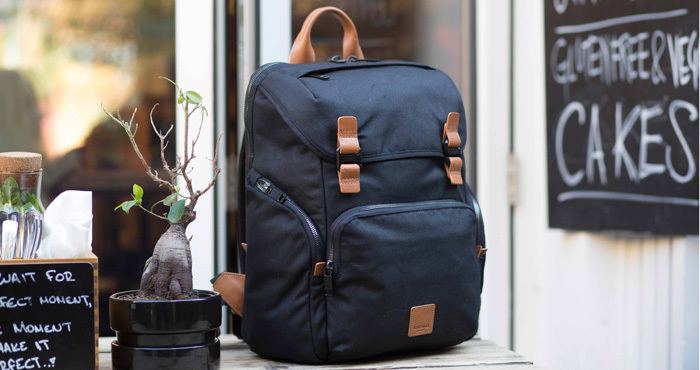 The bag is made of a waxed cotton canvas, which makes it water repellant and rugged enough to stand up to everyday wear. And, there’s plenty of room for packing all your gear. 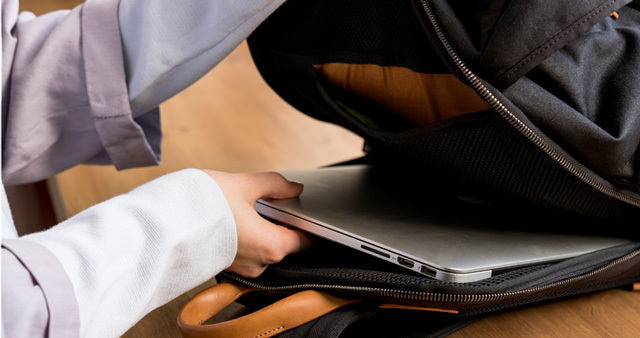 A slim foam-padded compartment at the back provides protection for your laptop (up to 15.6 inches) or tablet. The main compartment is roomy enough for clothing and larger items, plus it has ingenious elastic straps built-in to help you manage cords and keep them tangle free. And the flap that zips close on the top has two mesh pockets built-in for small items like earbuds. There’s also a tiny pocket that holds a Chipolo Bluetooth location tracker for those that are concerned about misplacing their bag or having it stolen. If your bag is nearby, you can make the Chipolo emit a loud sound or you can find it on a map in the app. The tracker will also communicate with the larger Chipolo community, so can receive updates from other users who are near your bag. For slightly larger items, there’s a top compartment (think sunglasses) and two side pockets. 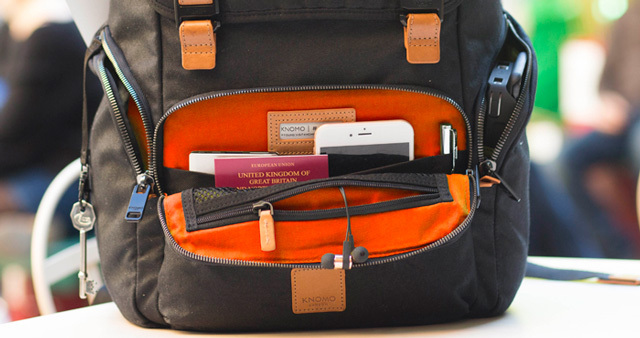 One of the side pockets has a wireless 4500mAh battery charger built-in, which Knomo is calling DropGo charging. 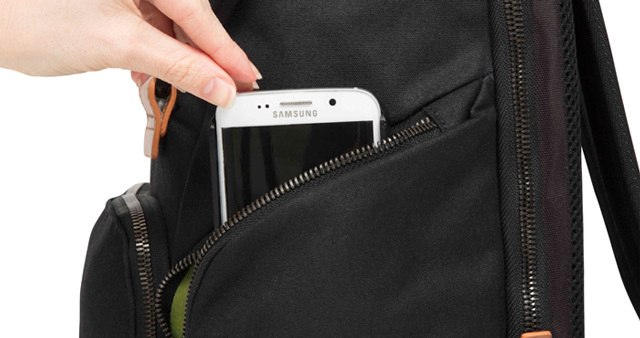 With the purchase of your LiveFree Backpack, you’ll receiver a Qi wireless charging sleeve designed so you can easily slide in a Samsung Galaxy S6/S7 or an iPhone 6/6s/7 (a wireless charging case is included for iPhones). The other compartment is designed for a 500ml water bottle and has a place to clip in your keys. And, since the LiveFree Backpack is designed to be your one and only bag, it has a front pocket with RFID blocking for your credit cards, passport a much more. Dimensions are 15.7” x 11.8” x 8.3”, and weight is 2 pounds 3 ounces. You can acquire the LiveFree Backpack through Knomo’s kickstarter campaign (which is already fully funded and goes through May 7, 2017 8:59AM EDT). A LiveFree Backpack with Chipolo tracker costs $236, a LiveFree Balck with Chipolo tracker and DropGo wireless charging system is $277 for Samsung phones or $313 for iPhones.